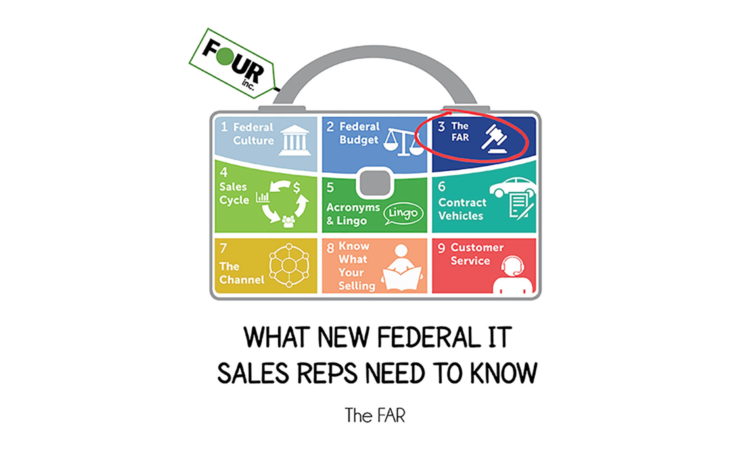 What New Federal IT Reps Need to Know: The FAR - Four Inc. The Federal IT business is all about orders. Orders are how you measure performance and keep score. But, to simply tell a sales rep to go out and bring in orders is like telling a golfer to go out and put the ball in the cup. Effectively selling to the Federal Government requires a number of skills and an understanding of several bodies of knowledge. One of the most important bodies of knowledge to know and understand well is how the Government makes purchases, i.e. what it takes to get an order from the Government. The U.S. Federal Government uses a vast system of procurement rules and procedures to manage how it makes purchases. These are called the Federal Acquisition Regulations, their intent is to establish a consistent set of practices used by federal agencies that promote fair, impartial competition for government opportunities. The rules and procedures making up the federal governments procurement system are all contained in a document called the Federal Acquisition Regulations, or the “FAR”. The FAR is a 2,000+ page document organized into eight subchapters, which are subdivided into a total of fifty-three parts, which are then further subdivided into subparts. The language that fills the FAR, is commonly referred to as clauses. If you’ve spent any time in the government sphere, you’ve likely heard people mention “FAR clauses” before, this is what they’re talking about. Now the realization that you need to understand a document that’s double the size of War and Peace might be a little bit overwhelming. The good news is that you don’t have to read the entire thing. The FAR is a reference guide, not required to commit to memory, only something requiring you to know when to look. Here is an overview of the subchapter of the FAR, with some of the more useful subparts noted within each. So, unlike your college textbook, you don’t need to memorize the FAR. That said, it’s still an incredibly important document for you to know. Here’s how you can use it on a day-to-day basis. The FAR is best used when you’re faced with a specific question. For example, maybe you work for a small business with a socioeconomic status that affords it a competitive advantage. However, you’re not really sure what that competitive advantage actually is or how and when the advantage is specifically invoked. Rather than asking a manager, you can proactively reference FAR Part 19, which details size standards for small businesses, set-asides for Small Business, and other useful topics. Another example would be if you want to submit a proposal offering Commercial-off-the-Shelf (COTS) software licenses. However, during the course of your discussions with the customer they have made it clear that they will NOT accept any End User License Agreements (EULA). The Manufacturer of the software product your offering is not willing to modify their EULA. You could view this as a hard stop sign and abandon the sales effort, or you could dig into the FAR part 12 – Acquisition of Commercial Items. Here you’ll find what exactly the Government is required to accept, and not accept, when it buys commercial items and you could use this in making the case for the objecting Contracting Officer. Why Do I Need to Know the FAR? Up until now, we have been focused mostly on the benefits an understanding of the FAR confers on the upfront stages of a sales cycle. The reality is that understanding the FAR benefits every stage in a sales cycle from well before a solicitation is released to long after a contract has been awarded. There is a habitual tendency to view the Government’s procurement rules and processes as restrictions on what might otherwise be reasonable behavior. While it would be hard to deny that the Government’s procurement processes are more efficient than they are bureaucratic, they also aim to achieve equitable solicitations and awards. And, this view still shortchanges the true value of the FAR. So, while it’s here governing how we interact with our customers, it would only benefit both parties to understand what the FAR allows and what it does not allow so that we only spend time on viable sales efforts and are prepared should an objection arise or a negotiation ensue. The following link takes you to a table of contents from which you can access the complete FAR: https://www.acquisition.gov/far/html/FARMTOC.html.